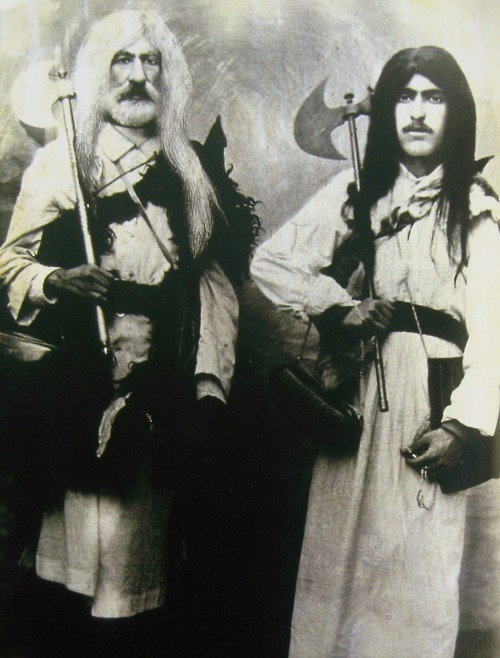 This photo shows a pair of Jewish dervishes. It has been going around the Jewish-oriented pages of the internet and social media lately, and it got me wondering: would this be a problem of following the ways of non-Jews, especially religiously-oriented practices? Related: May a Jew be a Freemason? In this week’s parasha, parashat Re’eh, we learn of the Biblical command that the People of Israel must destroy all vestiges of pagan and polytheistic worship, whenever they are found. The Torah, in Deuteronomy 12:2 reads, “You shall utterly destroy all the places where the nations that you shall possess worshipped their gods: on the high mountains and on the hills, and under every leafy tree.” The Torah, in Deuteronomy 12:3, follows with specific demands that the Israelites break apart all the pagan altars, smash their pillars, and burn their sacred trees in fire. The idolatrous carved images must be cut down, and the Israelites shall obliterate their names from that place. So if any form of idolatry is involved, it will be obviously forbidden. This blog tries to explain “Chukas Hagoy”. The Torah warns us to avoid “chukkat ha goyim” the “statutes of the nations.” As a holy nation, separated by the unique discipline of the Torah we are sternly warned to avoid gentile practices. The law is complicated and this is just meant to be a quick review to expose my thinking. the prohibition, says Rashi, applies particularly to Non-Jewish practices that reflect corruption, idolatrous superstitions or such things as attending “theaters or stadiums.” We are told elsewhere that the prohibition is on attending theaters and stadiums is one of the first and few laws that a potential convert must be taught. This refers to the Roman stadiums which were the site of violent gladiator games. Jews were and are forbidden to enjoy entertainments which focus on degrading human beings and torturing animals. In general, these prohibitions distance Jews from things that are not in keeping with Jewish values. By contrast, the Shulchan Aruch (Yoreh De’ah), the most authoritative code of Jewish law concludes that if the custom does not promote idolatrous behavior and/or is viewed as a "dignified act", then no such prohibition of "chukat HaGoy" exists. While there may yet be other halachic prohibitions that would restrain a Jew from taking up such a practice for themselves, there is surely no reason why we should discourage others from following it. On the contrary, I believe the obligations of Jewish spiritual citizenship may demand that we encourage it. That is where my thoughts begin. Being a Dervish does seem to have its origin in “ gentile practices”, (Sufi Muslim) and I suggest that there is not a tradition (for others than special individuals) of asceticism in Judaism; therefore it seems that these would be “things that are not in keeping with Jewish values”. Not the answer you're looking for? Browse other questions tagged halacha minhag gentiles symbols-symbology hukot-hagoyim .